If you are planning a staycation in Singapore, Capri by Fraser, Changi City/Singapore offers the unique hospitality concept of a “hotel residence” which combines the extensive range of facilities and services of a hotel with the comfort and convenience of a full serviced residence. Capri by Fraser is urban inspired, high-tech and intuitive to cater to the lifestyle needs of the digital generation, offering fast and free Wi-Fi throughout the property, iPad-activated check-ins, ePrint facilities, an interactive eConcierge, and iPod docking stations in every room. The interactive touch-screen 3-metre e-Concierge (see picture below) is a very cool concept where you can plan your stay at Capri by Fraser with up-to-the-minute weather and flight information, updates on special events and happenings around town, public transport and nearby attractions. You also have the option of planning activities according to interests such as Arts & Entertainment, Culture & Heritage, Nightlife, Sports & Recreation, Family Fun, Shopping and Hip Hangouts, all at the easy touch of a finger. We printed out our cycling route at the concierge after spending just a few minutes on the screen figuring out the best route to take (more about our cycling adventure in the later part of this post). There is a lot to see and do right in the hotel public areas itself for example, you can check out the interesting international art installations at Capri by Fraser. These series of installation art reflects the Movement and Connectivity between today’s world travellers. Although we are not the art-connoisseur type, we can appreciate how these delightful variation of colours, shapes and textures create a sense of style and realism in each distinctive social space. 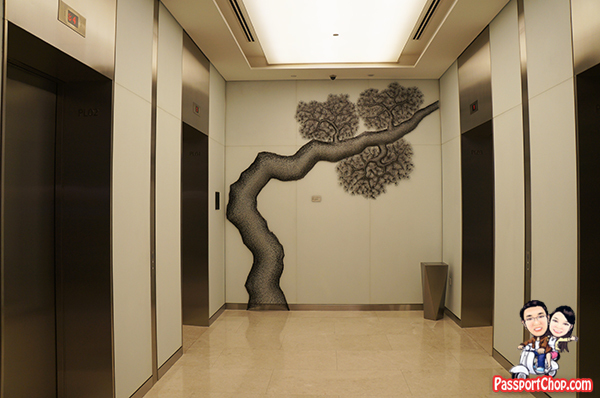 2 of our favorite artpieces are the Men On the Road on one of the lobby walls and The Old Pine Eternity Tree at the lift lobby area. Men On the Road is a series of 198 individually crafted clay “bo-men” figurines, created by internationally acclaimed Belgian artist Daisy Boman, that climb, fall, crawl and run as they interact with each other to reach a higher goal. 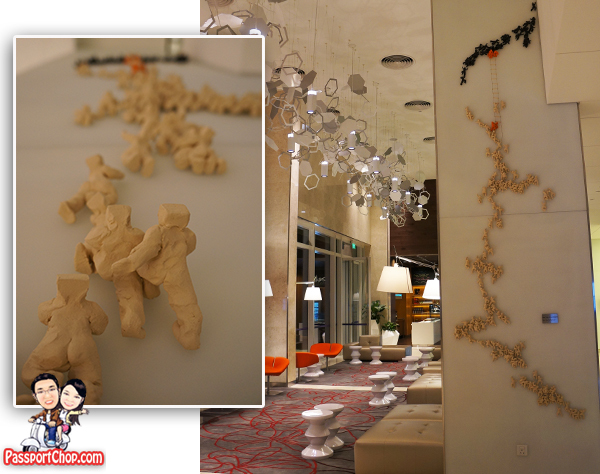 What I can gather from this artpiece is the facelessness of the “bo-men” tells us to look beyond personal identity and to look at the actions of the figures both independently and collectively – in other words, look beyond race and class and work together to strive towards a better future. The oriental mise-en-scene stainless steel and copper sculpture The Old Pine Eternity Tree by Korean artist Lee Gil Rae, depicts the strength and vitality of life. It also tells the story of life’s connectivity in a nature-friendly co-existence. Capri by Fraser, Changi City/Singapore’s 313 suites (from the Studio Superior to Studio Grand suites) have been specially designed to feature well-defined living spaces. 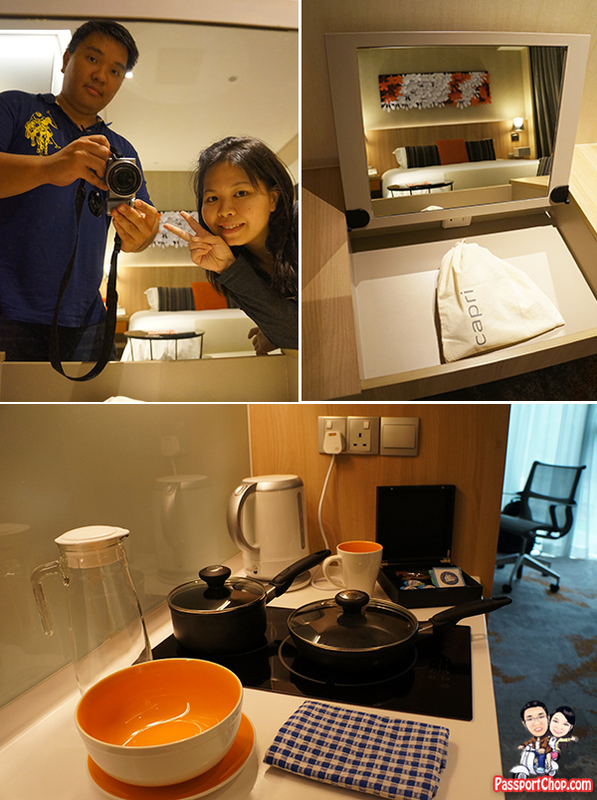 During our stay, we checked out the 32 sqm Studio Superior suite which had a very well-planned room layout that managed to accommodate a spacious bathroom, a walk-in wardrobe, kitchenette and work space. The kitchenette is fully equipped with cooktop and hood, microwave oven with convection and grill, 90-litre fridge, sink and Nespresso machines, to provide the added convenience of being able to cook in – after all, Fairprice Extra and Cold Storage are only minutes walk within the vicinity – if you want to prepare home-cooked food during your staycation, you have all you need to whip up a few dishes (cooking skills not included). If you find cooking a hassle, you can also check out the dining options at Capri by Fraser – Caprilicious (all-day-dining restaurant where breakfast is served daily), Delite (deli), Drinx (lobby bar) and Ripples pool bar. There is a set of small Kettle Chips, Nuts and popcorn included with the room – so if you just want a quick snack – just pop the pack of popcorn kernels into the microwave oven and make your own popcorn! One thing that you should try during your staycation at Capri by Fraser, Changi City/Singapore is turn your suite into an impressive home entertainment hub. Just plug your iPod/iPhone into the docks which is connected to the chic Geneva Sound System or borrow a DVD and enjoy the movie with the room’s 42″ flat screen LED Smart TV and DVD players. 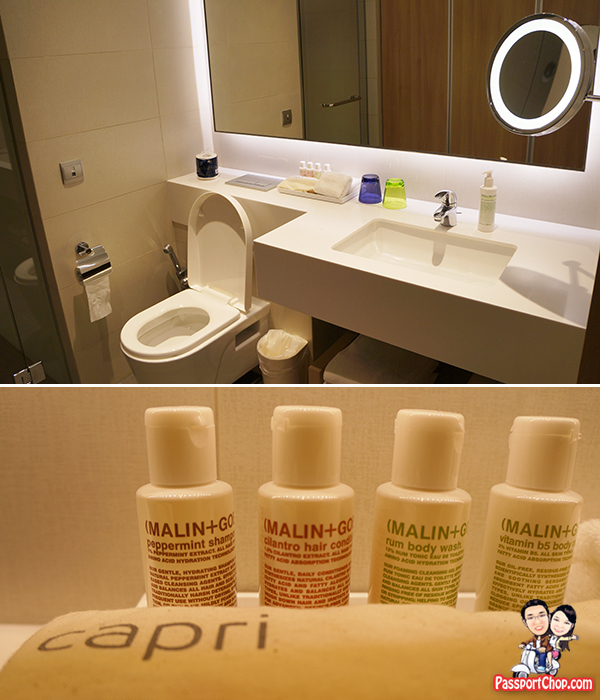 For the spacious bathroom, I have only one word to say about it – “Malin + Goetz“. That is not really a word but a brand of luxury amenities that is provided in the bathroom – you just have to try it and you know why it is awesome. Expect invigorating rain showers and open walk-in wardrobes (with the standard stuff – bathrobes, safe, ironing board and not a very standard item – laundry basket – more about that later) too! One of the main highlights of Capri by Fraser, Changi City/Singapore is that in addition to laundry services the hotel residence provides, guests have the option of doing their own laundry anytime they want at the unique self-service laundrettes that include host of entertainment activities such as Xbox Kinect, foosball, and TRX training to keep guests occupied in between spin cycles. These laundrette facilities are available on every floor. 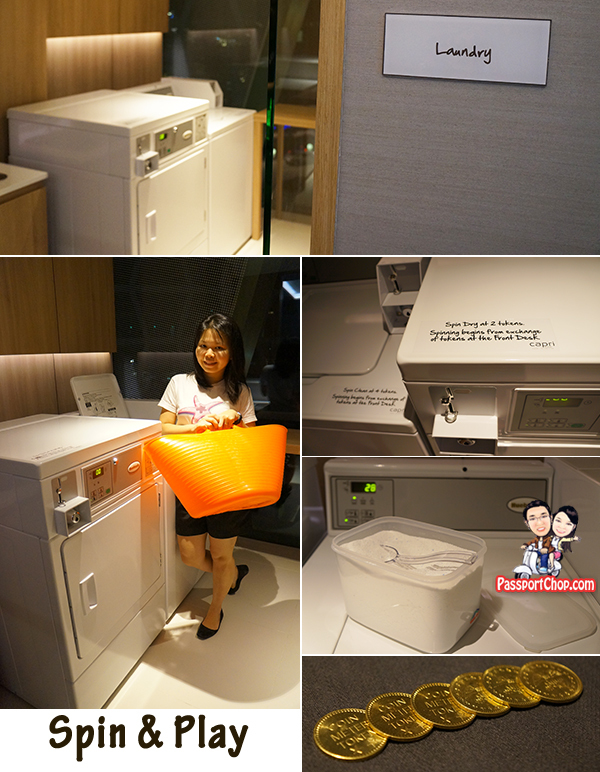 To use the laundrette (washer and dryer), you will need to buy tokens from the reception (Each token cost S$2 – 4 tokens (S$8) are needed to wash your clothes – and these washing machine are heavy duty ones and can take quite quite heavy loads; 2 tokens (S$4) are needed to dry the washed clothes – so a total wash and dry load will cost S$12). Washing powder is provided – a whole tub of them! How to carry your clothes from room to the laundrette? – that’s where the orange laundry basket found in your wardrobe will come in handy! The laundrette rooms are called Spin & Play – precisely because while your clothes spin, you can use the waiting time to play! 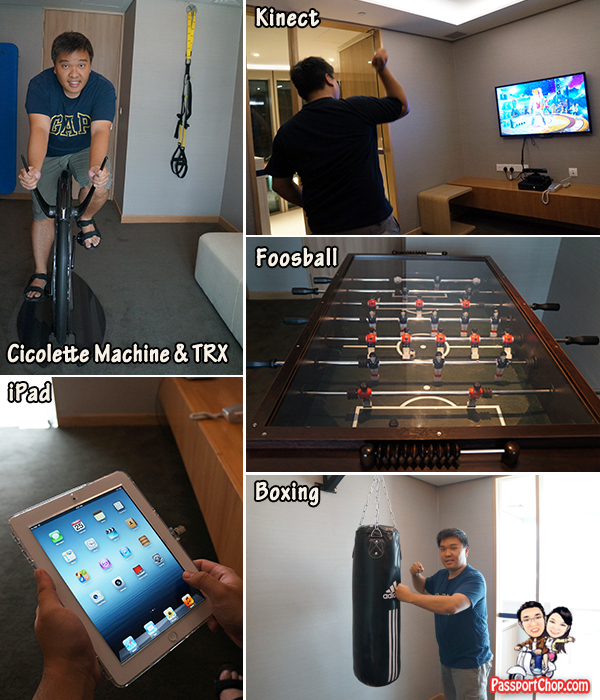 There are 5 different Spin & Play rooms across 9 levels at Capri by Fraser, Changi City/Singapore – the spin part is the same; the play part is the different one with a selection of Kinect (on level 3, 5, 7, 11), iPads (on level 4, 8, 10), Foosball on level 12, Cicolette machine & TRX on level 6 and Boxing (just a punching bag) on level 9. Tried them all – in my opinion Kinect is the best of all the “Play” options in the Spin & Play room with dancing and sports games. 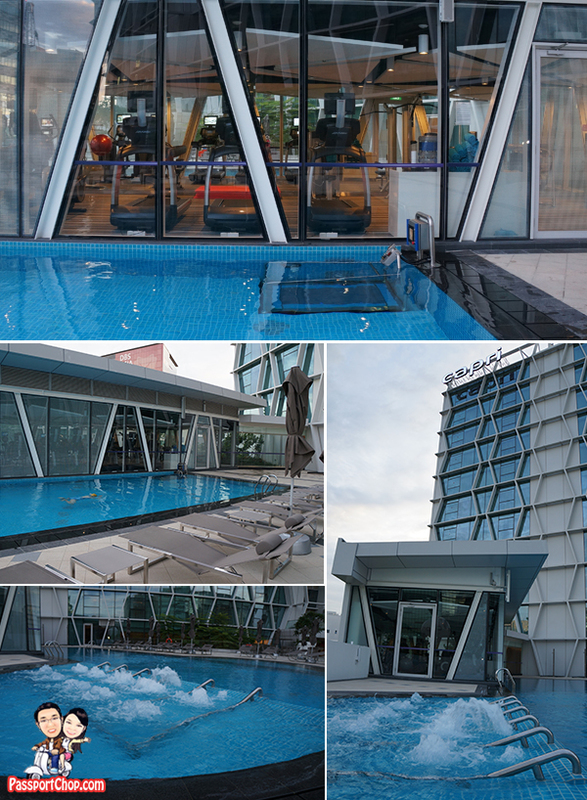 Other Capri by Fraser, Changi City/Singapore amenities include a 24-hour gym, outdoor pool with a state-of-the-art hydro treadmill, steam and sauna facilities. 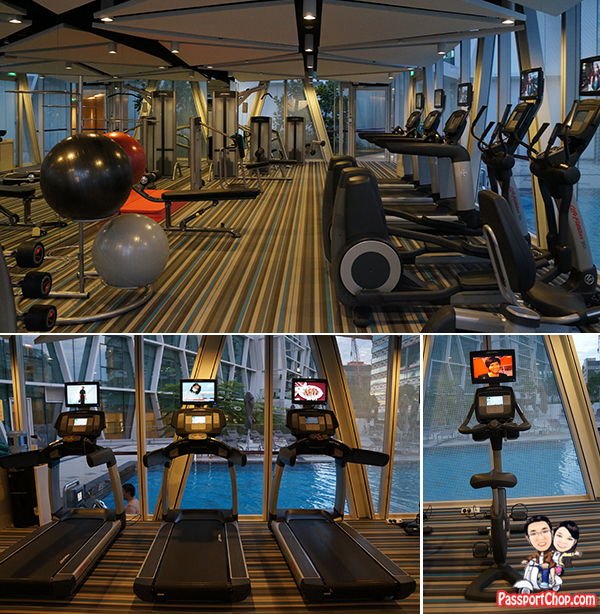 The gym is quite equipped with a great selection of training exercise machines and free weight. The best thing about the gym is that all treadmill machines have a TV plugged in to it so you can keep yourselves entertained while you run. You can also try out the hydro treadmill in the swimming pool if you are looking for low-intensity exercises. If you just want to chill out after a long day, just soak in the jacuzzi by the pool or by one of the interesting lawn chairs (known as EZ Hammocks) around the pool! Every Friday night on TGI Movie Night, Capri by Fraser Changi City/Singapore will screen one movie that has topped the box office previously by the poolside (level 2) so check it out from 7pm – 9pm every Friday (except on public holiday, private events and wet weather). If you still want more after all the Spin & Play, Hydro-Treadmill, Gym, Capri by Fraser, Changi City/Singapore also offers loans of TREK bicycles (Free! ), decide on your preferred cycling route with the e-Concierge and print out your cycling route at the concierge (or if you want to cycle around the area – you can also skip the maps) and approach the concierge to book the time you want to pick up your bicycles. We had plans to cycle to East Coast but instead to just cycle around the area e.g. 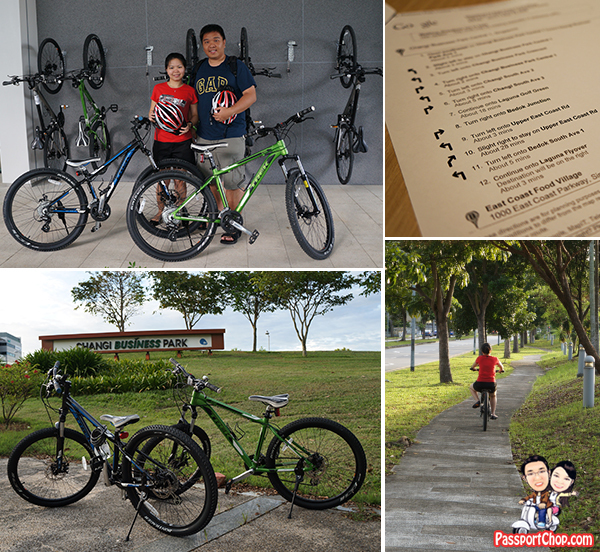 Changi Business Park – considering that its a weekend, there isn’t a lot of traffic so cycling is a breeze around this area. 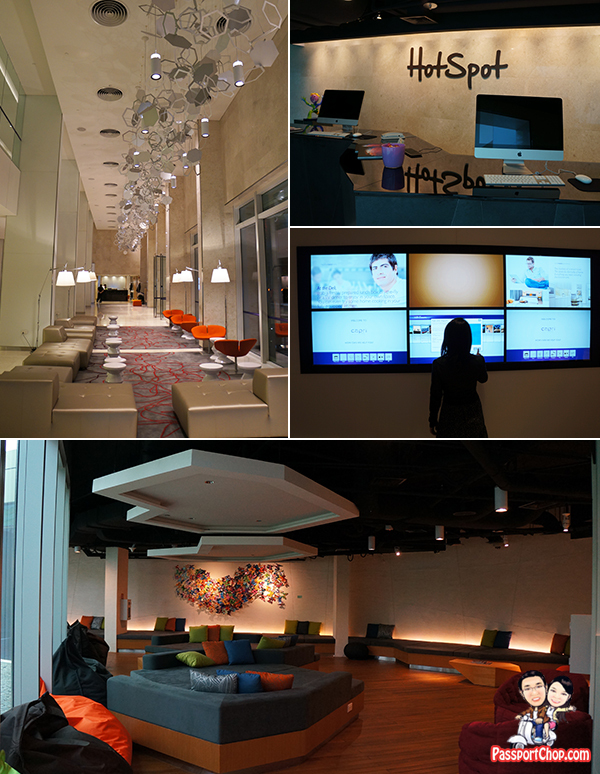 Check out http://singapore.capribyfraser.com/ for promotions and more details about Capri by Fraser, Changi City/Singapore. You can also call 1800 338 0800 or email [email protected] for more information. Capri by Fraser, Changi City/Singapore is located at 3 Changi Business Park, Central I, Singapore 486037. Nearest MRT is Expo MRT station – just walk through Changi City Point shopping centre (lots of other dining and shopping opportunities just minutes from Capri by Fraser). 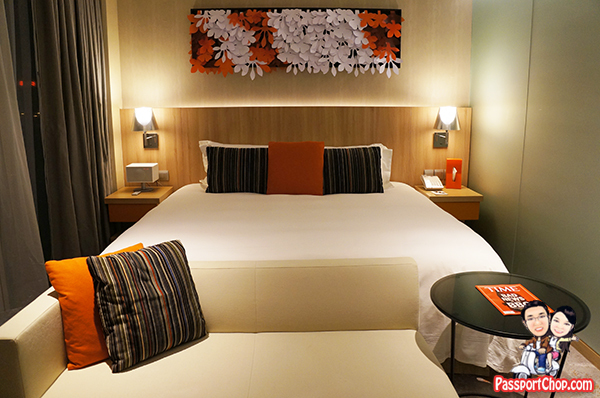 If you are planning to visit IT fairs or any of the major fairs at Expo, why not combine it with a staycation at Capri by Fraser, Changi City/Singapore so you have a base to take a break in the midst of all that shopping at the fairs! You really make it seem really easy together with your presentation but I in finding this topic to be really something which I believe I would by no means understand. It sort of feels too complicated and very broad for me. I am looking ahead for your next publish, I will try to get the dangle of it! Looks like a pretty great place for a staycation! Is this an advertorial, or a self-paid visit? PS : Set up a spam filter or something?